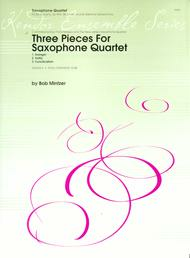 Three Pieces For Saxophone Quartet (Commissioned by Frank Masseo and The New Jersey Saxohpne Quartet). Composed by Bob Mintzer. For Bb Soprano saxophone, Eb Alto Saxophone, Eb Baritone Saxophone (soprano, alto, tenor and baritone saxophones). Grade 6. Score and set of parts. Duration 10 minutes, 40 seconds. Published by Kendor Music Inc (KN.16354).This quartet in three movements draws upon the jazz, classical and R&B traditions. Knowing how to handle swing 8th notes, a slow choral, and an even 8th note funk groove is essential. Lots of rhythmical interplay among parts will be the greatest challenge in rehearsals, but the work will be well worth the effort. Total duration 10:40.